Cooking couldn’t be easier this time of year. What with all of the lovely produce that’s currently in season (tomatoes, corn, basil, squash, green beans...I could go on for awhile) it’s hard to go wrong. And because it’s so fresh, there’s not much you need to do to turn this beautiful summer produce into a fantastic meal. I know I’ll be looking back wistfully at this post in January when I’m dying for some fresh, perfectly ripe tomatoes and succulent corn on the cob. But for now, let’s just enjoy summer’s bounty with 5 easy (not to mention delicious) sides that make the most of what’s currently in season. If you haven’t used up all of your zucchini making this Summer Squash and Tomato Gratin yet, here’s another use for it. Slice summer squash into ¼ inch rounds. Heat some olive oil in a pan at medium heat on the stove. Add some finely chopped garlic and cook for about 1 minute until garlic is soft and fragrant. Add the squash, and continue to cook until squash is cooked through, about 5 minutes. Season with salt, pepper, and fresh lemon juice. Transfer squash to a serving dish and top with fresh mint and a sprinkling of red chili flakes. Serve immediately. Yet another use for the ubiquitous Basil and Arugula Pesto I told you about earlier this summer (I told you this was good on everything). Preheat oven to 400 degrees. Mix fingerling potatoes with some olive oil and toss to coat. Season with salt and pepper. Place potatoes in a single layer on a baking sheet and bake for about 25-30 min, until roasted and tender. Alternately, wrap the potatoes inside of a foil packet and place on a heated grill. Grill packet until potatoes are tender, 20-25 minutes. While potatoes are still warm, top with basil and arugula pesto and mix to combine. Serve warm or room temperature. Trim the green beans and cook in a pot of boiling water for 2 minutes. Immediately remove beans from boiling water and place in a bowl of ice water to shock them and stop them from cooking further. Heat some olive oil in a pan on medium heat. Add some finely chopped garlic and cook for about 1 minute until garlic is soft and fragrant. Add some halved cherry tomatoes, and continue cooking until tomatoes are soft, about 5 minutes. Add the green beans to the pan, along with some balsamic vinegar, and chopped fresh basil and continue cooking until beans are heated through. Season with salt and pepper. Transfer beans to a serving dish and top with grated parmesan. Shuck corn and discard husks. Spread each cob with softened butter and season with salt. Place each ear on a sheet of aluminum foil and top with smoked paprika and fresh lime juice. Completely wrap each ear in aluminum foil. Grill directly on hot coals, or on the grill grate for about 15 minutes, turning occasionally. 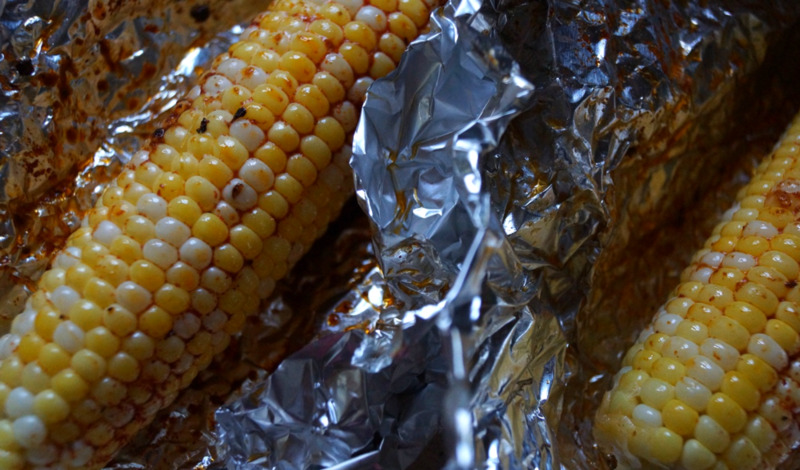 Remove from grill and allow corn to cool slightly before unwrapping and enjoying. You can make this salad in about 5 minutes and turning on the stove is not required. Use whatever tomatoes and herbs you have handy. I really like the added flavor and texture from using different varieties and sizes of tomatoes (cherry tomatoes, slicers, heirlooms, etc), but if you just have one type of tomato on hand, it will still taste awesome. Slice tomatoes into about ¼ slices and arrange on a plate. Top with some thinly sliced celery (adds a nice textural crunch), some chopped green onions (dark green part only), and fresh herbs such as basil, thyme, parsley, mint, or any mixture of these. Crumble on some good bleu cheese (I used a Hook’s Blue Paradise here) and drizzle with extra virgin olive oil and balsamic vinegar. Finish with a pinch of salt and some freshly ground black pepper.